"You guys kept putting that monkey on me this week," a smiling Gruden said after the win. "As I told our team, we're 1-0. Now, it's time to put back-to-back games together (with a home game against Indianapolis next week)." The Cardinals lost the debut of head coach Steve Wilks' career. Peterson, a late acquisition during the preseason, said about the convincing win: "I feel like the sky's the limit for us." "Alex is doing a great job of running the offense, and for the past couple of weeks I've seen these receivers really go out at practice and grind," Peterson added. "Like I say, the offensive line speaks for itself. And then you add CT (Thompson) in there, you know that young guys got me going today." Entering the game, Gruden stressed the importance of an effective start on the road. The Redskins, who were outscored 102-49 in his previous four season openers, responded with one of their most dominating first halves of Gruden's tenure. 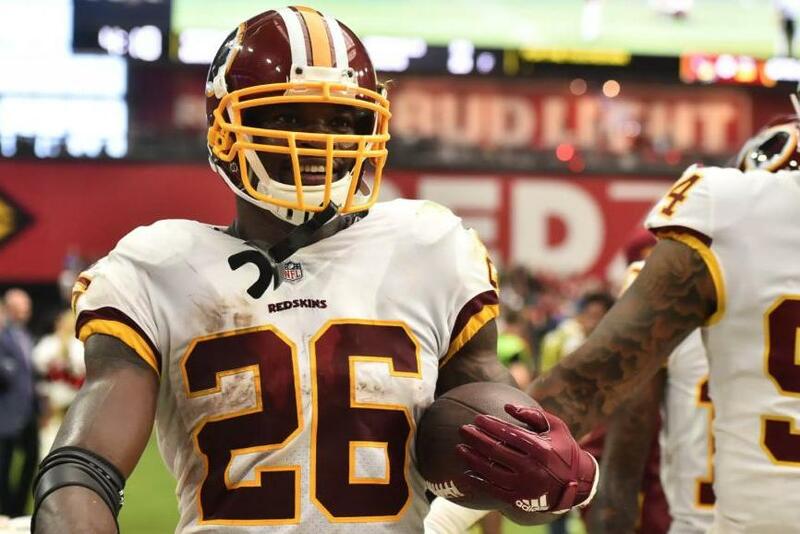 Their first possession stalled after a couple of penalties moved them out of field goal range, but the Redskins then mounted three consecutive touchdown drives of at least 10 plays. They outgained Arizona 261-36 in the first half, during which they made 22 first downs to the Cardinals' two and built a 21-0 lead. "When you get in a situation where you get behind, it sometimes gets you out of what you really want to do," Wilks said. "All night, we were playing catch-up and that was really the issue, that we were never really able to get into a rhythm when we go behind." A late touchdown run by David Johnson denied Washington its first shutout since a 23-0 win over the Philadelphia Eagles on Sept. 30, 1991. The Redskins' defense that ranked last against the run last season, limited Johnson to only 37 yards on nine carries. Washington's secondary, led by cornerback Quinton Dunbar, made open-field tackles to end Arizona drives and broke up five Sam Bradford passes. The Cardinals' quarterback, acquired during the offseason, completed 20 of 34 pass attempts for only 153 yards. Smith was on target from the start against the Cardinals, completing 17 of 20 passes for 171 yards and two touchdowns in the first half. Smith showed why the Redskins' brass was confident signing him after allowing Kirk Cousins to go in free agency. On Washington's second touchdown drive in the first half, Smith picked up a first down on a fourth-down quarterback sneak, found tight end Jordan Reed for a 22-yard completion after avoiding pressure, scrambled seven yards on another play, and connected with Jamison Crowder for a 10-yard gain to the Arizona 4. "It felt good to see a lot of runs in there and knowing I had the opportunity to contribute, and that's what I want to do," Peterson said. Thompson's 13-yard touchdown reception from Smith put Washington ahead 7-0 on the first play of the second quarter. "The worries went away, and maybe it was adrenaline or something, but today was really the best that I felt ever since my injury, and I was able to go out there and make some plays," Thompson said. The Redskins capped the scoring in the first half, driving 92 yards 10 plays in 3:11, culminating with Smith's 4-yard touchdown throw to Reed with 8 seconds left. Johnson scored on Arizona's ensuing possession, finishing a 13-play, 75-yard drive, with his 2-yard run.